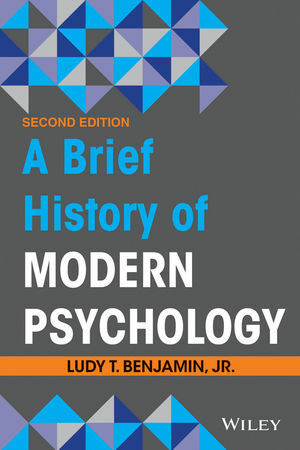 In A Brief History of Modern Psychology, 2nd Edition, Ludy Benjamin, leading historian in the field, discusses the history of both the science and the practice of psychology since the establishment of the first experimental psychology laboratory in 1879. Ludy T. Benjamin, Jr. is Professor of Psychology and Educational Psychology at Texas A&M University and is holder of the Glasscock Professorship and a Presidential Professorship in Teaching Excellence. His numerous publications include From Séance to Science: A History of the Profession of Psychology in America (with David Baker, 2004) and A History of Psychology in Letters (second edition 2006, Blackwell). Much new material has been added to this edition, reflecting the growing scholarship on the history of psychology and related fields. To accommodate these additions and still keep the book in its brief form, the amount of biographical coverage have been reduced. However, the biographical content necessary to provide context to understanding the theories, research, and practices described in this book has been maintained.